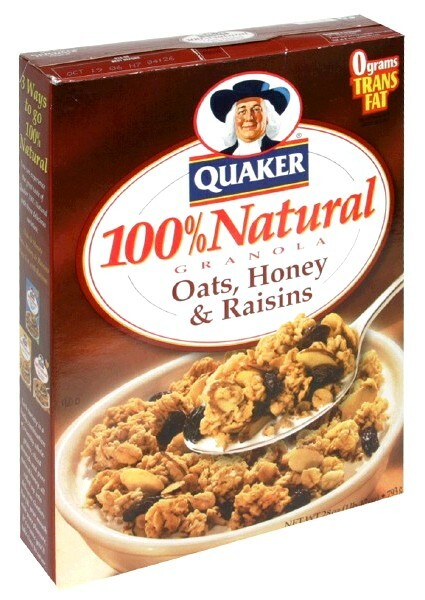 Now take a look at the old (1997) box of Quaker 100% Natural, recently bought at a Walmart. Notice the background is different; showing a glass of orange juice and a pitcher of milk. The old box also has a blue banner on the bottom. All of those are missing from the new box. March 9, 2018 (UPI) -- A Colorado father said he bought a box of cereal from Walmart this week and ate an entire bowl before discovering it had expired -- 21 years ago. 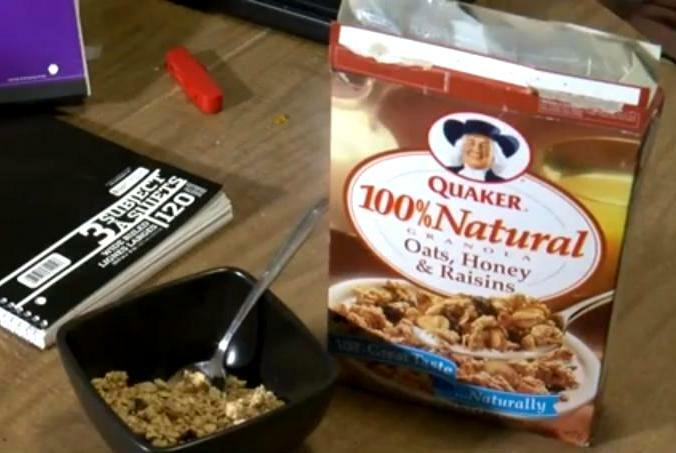 Josiah and Anthea Carelse of Lakewood said they bought the box of Quaker 100 Percent Natural Granola cereal from the Walmart in Littleton on Monday and they later sat down to eat some of the breakfast food. Anthea Carelse said she took only a couple bites before deciding something was off about the taste, but Josiah ate an entire bowl. "I just started eating and thinking, 'It just tastes funny. It must be OK,'" Josiah Carelse told KMGH-TV. The couple said it wasn't until after Josiah finished his bowl that they noticed the "best by" date on the box. "It looks like February 22, 1997," Anthea Carelse said. The couple went online and verified the box did not look like Quaker's current design for the cereal, and the product they purchased indeed appeared to be a full decade older than their 11-year-old daughter, Layla. "We just grabbed this off the shelf and yeah... 21 years old," Josiah said. The United States Department of Agriculture said "best by" dates are voluntarily printed by manufacturers. "Manufacturers provide dating to help consumers and retailers decide when food is of best quality. Except for infant formula, dates are not an indicator of the product's safety and are not required by Federal law," the agency said. The Carelses said they plan to return the box of cereal to Walmart. A Walmart representative said the company is investigating the matter. What does an expiration date really mean? The idea of expiration dates actually sprouted from a concern for food’s freshness, not necessarily its safety, so the majority of food dates have to do with how fresh they will be by a certain time, not necessarily how spoiled they'll be. You might also not know the difference between labels placed on food products. The “Sell by” date, for example, only refers to how long a store can keep the product on its shelves. 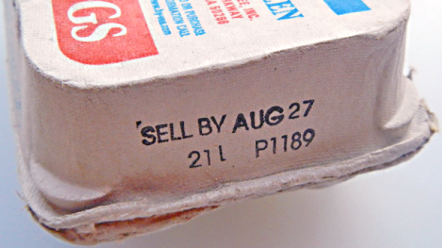 Food lasting past the “Sell by” date shouldn’t be tossed just because it’s a few days past the timeframe that it should have been sold at the store. The “Best if used by” date defines the timeframe that foods will be freshest, but this doesn’t pertain to safety, either. The “Use by” date, meanwhile, is the last day for “peak quality,” meaning the food’s taste and quality may get worse afterwards, but it doesn’t necessarily mean you’ll get sick if you eat it. The only label, in fact, that has anything to do with food safety is the “Expiration” date, which should typically be adhered to. As darkness falls, your local supermarket becomes a hive of activity. 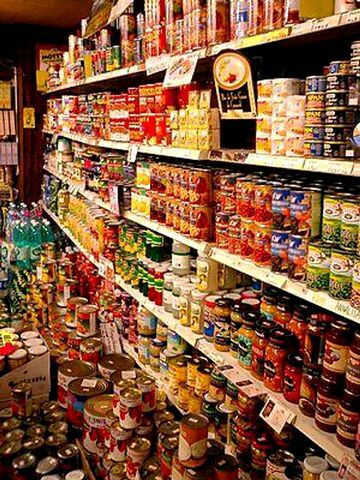 From canned vegetables and salad dressings to fresh vegetables and deli meats, countless items are removed from shelves by night staff. Approaching their expiration dates or because they are no longer at their peak quality, most stores consider them unfit for sale. With 15,000 different products in an average supermarket and 25,000 in a superstore according to the Food Marketing Institute (FMI), retailers in the US are lumbered with endless pounds of past-their-prime items every year. So what comes of all of this food? Fresh vegetables and meats, are often cooked up for in-store deli and salad counters before they spoil, says supermarket consultant David J. Livingston. A portion of it is inevitably thrown into the garbage and ends up in landfills. But surprisingly much of it finds a second home. Some is given away to food banks, some sold to salvage stores and the rest taken by people who scrounge outside supermarkets. With the current economic troubles, expired foods are increasingly becoming a part of America’s diet. Salvage stores are seeing a steady uptake in business from cost conscious consumers. Similarly food banks across the country have reported an increase of up to 40 percent in the demand for emergency food assistance in the last year, according to a survey by Feeding America, a network of over 200 food banks.